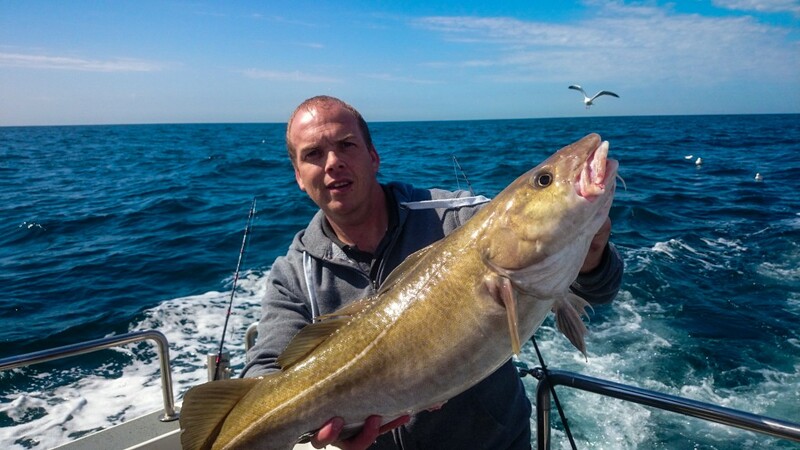 Combine the youth and exuberance of a young charter boat skipper with Eddystone Eels, one of the oldest and best known names for lures in the UK and you get a great fishing combination, especially for a days Wreck or Bass fishing. 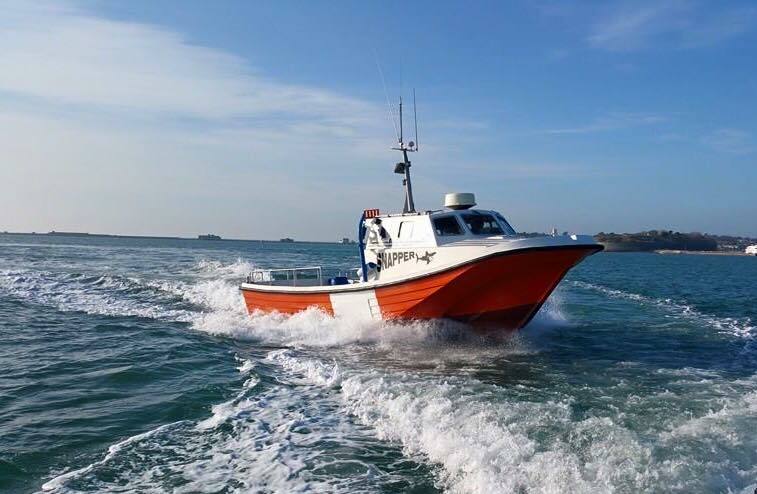 The Weymouth charter fishing fleet, has long been regarded as one of the largest and arguably the best charter fleets in the country. However over the past year, some of the more experienced skippers have hung up their rods, and left the game. Does this mean we will see a demise in the Weymouth fleet? No chance! Step forward 18 year old Luke Pettis, skipper of Snapper, a stunning Offshore 32. Some might think that an 18 year old charter skipper would be lacking in experience, well they would be mistaken. 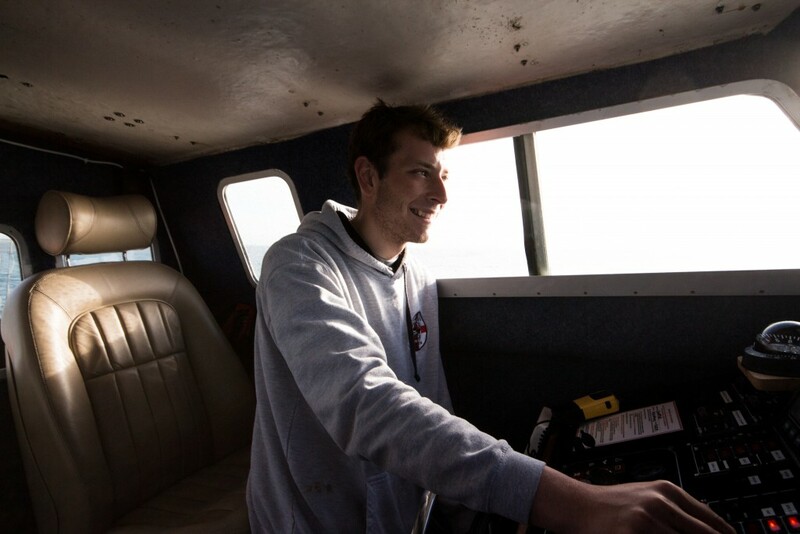 From a very young age Luke has crewed as a deck hand on charter boats, and over the past three years, he has worked as commercial potter and rod and line fisherman. 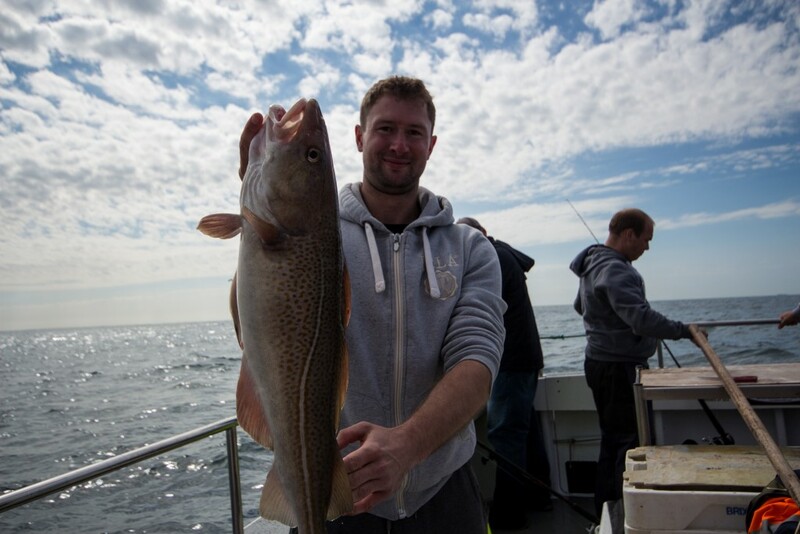 I was lucky enough to join him for a days wreck fishing, in search of Cod. I get excited about any fishing, the levels of excitement just vary depending on what I am doing, but wreck fishing is one of my favourite types of boat fishing. Add lure fishing into the mix and you can understand why I was dragging myself out of bed with ease at 5am. As with most wreck fishing an early start is essential to get plenty of fishing time in, so we headed off at 7am, with lovely conditions forecast. 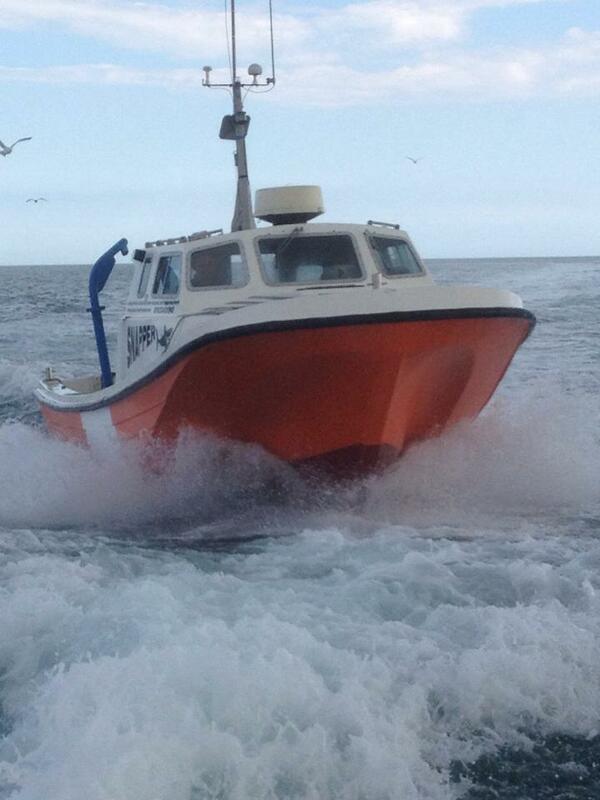 Having spoke to Luke on many previous occasions, he had told me that his boat was sponsored by Eddystone Eels. 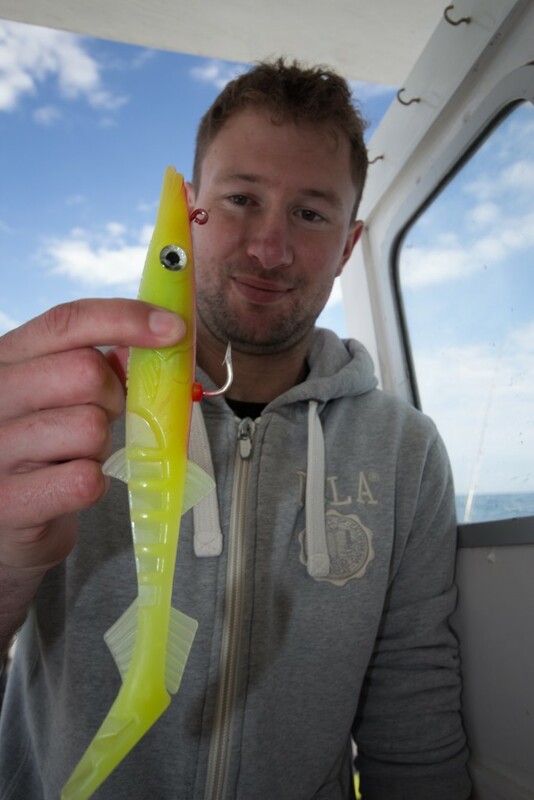 I am sure many of you are familiar with the Plymouth based lure company. I remember catching loads of Pollock on them from the shore when I first started lure fishing. So I was interested to see if Eddystone had improved their eels much since the original versions. I have to say I was very impressed with the selection that Luke showed me, especially the 2013 version, which come in a variety of colours and sizes, including this monster 10″ version, which to me looked ideal for the Cod. After a steam of just over an hour we arrived at the first wreck. 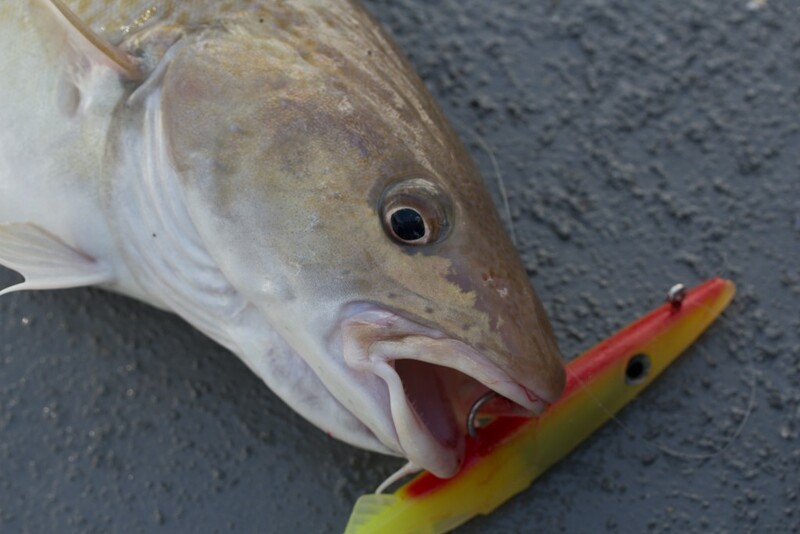 Everyone dropped their lures down, and it wasn’t long before myself and a few of the other anglers on the boat felt that steady knocking and pressure that you know is a fish hitting the lures. Everyone of the guys on the boat were seasoned anglers and didn’t need telling to keep winding until you know that fish is well and truly hooked. I was the first to land a fish which was a small Pollock of about 6lb. I was happy to shake it off the lure and let it return to the wreck. 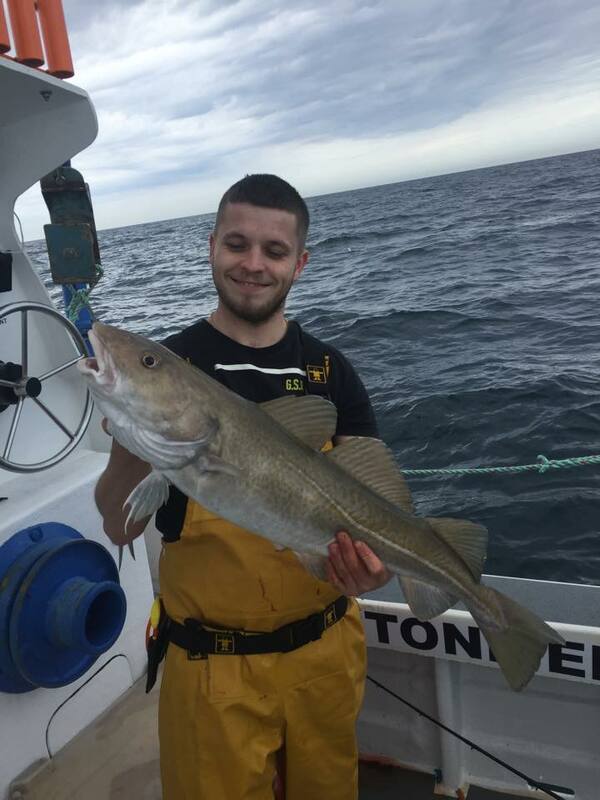 One of the other guys brought up a much bigger Pollock, before Chris Graziana boated the first Cod. Within a few drifts everyone had caught a few fish, but to be honest it was a bit slow, so Luke decided to move us a little further South to another wreck that had been producing some good catches for him. We were there within 15 minutes and it turned out to be a good move. We managed to get into the Cod straight from the first drift, with 7 out of 8 of us hooking up. Unfortunately I was was the one that didn’t, but that gave me time to dash around taking some pictures. 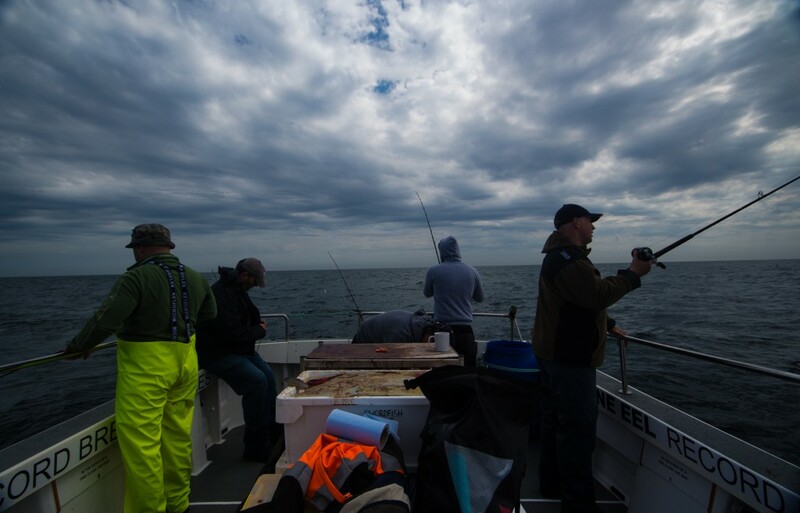 With normally only 8 anglers making up a wreck trip, there was plenty of room on the boat, which helped prevent tangles and gave everyone plenty of space to land their fish. After seeing everyone land some nice Cod, I decided that I would tie on the monster 2013 eel and see if I could get myself in on the action. As I lowered it down into the water and could still see it 20ft down, I knew that no Cod could resist such a lure, and I was right. Within seconds of it hitting the bottom and me winding up a couple of turns, I felt the familiar knock and head shake of a Cod. However after a few seconds I felt the fish drop off, I was gutted, but not for long, as another hungry Cod had obviously been watching the lure and immediately attacked it. After a spirited fight I was able to land my first Cod of the day, on the monster lure. 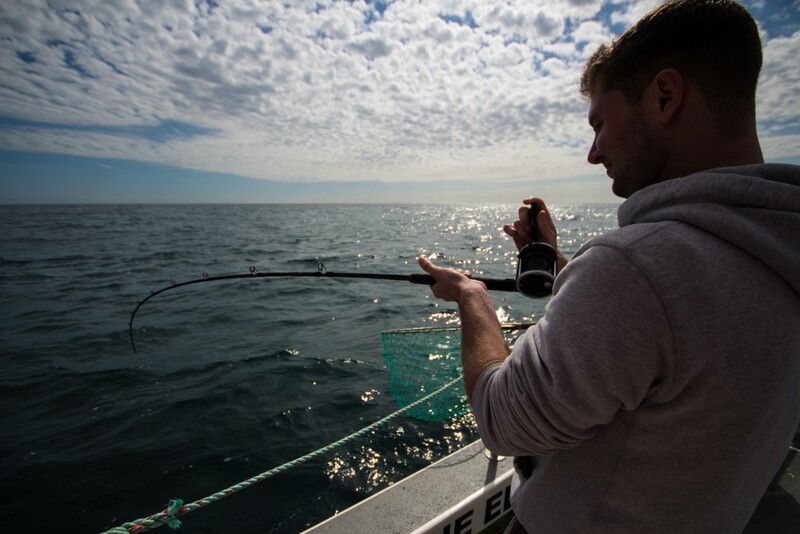 Feeling totally confident in the lure, I dropped it down for the next drift and sure enough I picked up another Cod. This was turning into a good day. If my day was good then Chris Carrol from Cheltenham,was having a red letter day. Every time I looked round he was into another fish. He certainly had the most fish of the day and the biggest, with this lovely double in prime condition. A lot of the Cod we caught looked to me like the same year class that we were catching from the shore back in the early part of last winter. The only difference was that they looked like they had put on a pound or two, which gives us great hope for this winter. The Cod were feeding heavily on small Scad, so I decided to put away Luke’s monster lure and try to match the hatch with one of the other Eddystone Eels that he had. It seemed that the blue and white 6 inch versions of the traditional lures worked best, as everyone continued to catch. 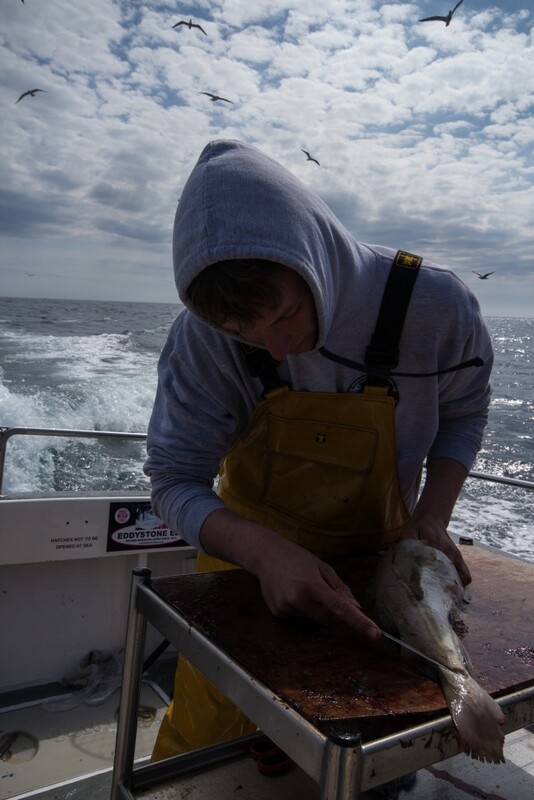 It was a good job that we had a return trip of over an hour to get back, as this gave Luke the time he needed to fillet everyone’s catch. I have to admit that I probably caught less than everyone else on the boat on that trip, but I will stick with the story that I was too busy taking pictures to be able to fish properly 🙂 Even so, it was one of the best wrecking trips for Cod I have been on, and I am sure most of the others would agree with me. 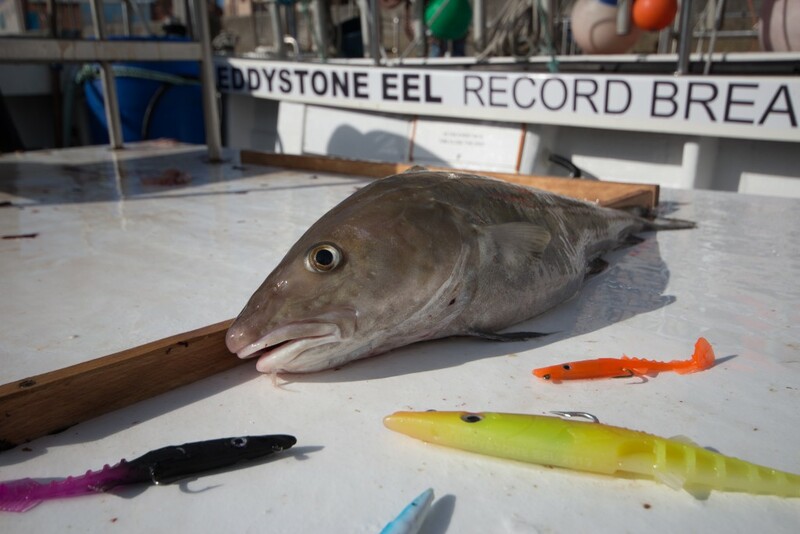 I especially liked the fact that I was able to try out a number of different Eddystone Eels that I had never used before. I will be using them again, both for wrecking and Bassing, so expect to hear more about them in the coming months. I also hope to get out with Luke on one of his Bass trips this year, and tap into his knowledge that he has picked up from his commercial Bassing days.